MLNP: If you like rad bootlegs and awesome blog-house... LIKE WHOA!! If you like rad bootlegs and awesome blog-house... LIKE WHOA!! LIKE WHOA this week will be the residents playground as Djs Mei-Lwun, Don Lynch and Claksaarb drop Mad Mixed bag House music for a diverse group of peeps. 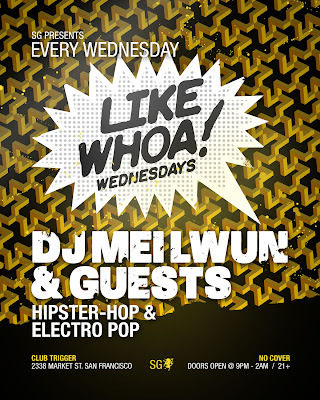 Trigger boasts a crazy good sound system and plush atmoshere plus an indoor/outdoor smoking/drinking room. Top shelf hootch $7 and $5 for a fernet and a beer. 2344 Market St SF 10-2 No Cover with RSVP! !